Scott’s works follow the transition from the eighteenth century Enlightenment to nineteenth century Romanticism. Scott’s novels present both the great and the ordinary caught up in historic conflicts between opposing cultures: Ivanhoe (1819) between Normans and Saxons; The Talisman (1825) between Christians and Muslims; and his Scottish history novels between old Scottish traditions and the new English order. Scott's egalitarian sensibility depicted heroism and moral elevation among men and women regardless of class, religion, politics, or ancestry. Throughout the body of Scott's work, principles of justice, honor, and integrity inform not only the values of his protagonists but play a role in historic events. Although critics have faulted Scott as a prolix, undisciplined writer, Scott's best novels wove sophisticated plots, keen social consciousness, and colorful characterization into enduring works of fiction. Scott achieved unrivaled popularity throughout Europe, America, and Australia during his lifetime, and despite a decline in reputation, his novels and poetry remain widely read. His widely quoted verse, "Oh! what a tangled web we weave/when first we practice to deceive," underscores Scott's insight into moral dilemmas, while his amiability, generosity, and modesty made him a respected public figure in his lifetime. 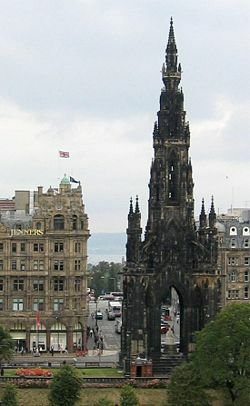 Walter Scott was born in College Wynd in the Old Town of Edinburgh August 15, 1771, the son of a solicitor. Scott survived a childhood bout of polio in 1773 that would leave him lame in his right leg for the rest of his life. To restore his health, he was sent to live for some years in the rural Scottish Borders region at his grandparents' farm at Sandyknowe, a region where he avidly explored in his leisure time. Scott walked up to thirty miles a day, while he learned the speech patterns and many of the tales and legends that would characterize much of his work. Also, for his health, he spent a year in Bath, Somerset, England. Scott attended Edinburgh University arts and law and was apprenticed to his father in 1786. In 1792 he was called to the bar, and in 1799, appointed sheriff depute of the county of Selkirk. In 1797 Scott married Margaret Charlotte Charpenter, daughter of Jean Charpentier of Lyon, France, and together they had five children. In 1806, Scott was appointed clerk to the Court of Session in Edinburgh. In 1796, at the age of 25, Scott translated and published some rhymed verses of German ballads by Bürger. In 1802-03 Scott's first major work, a three-volume set of collected Scottish ballads, The Minstrelsy of the Scottish Border, appeared. This was the first sign of his interest in Scottish history from a literary standpoint. Scott's next work, The Lay Of The Last Minstrel (1805), about an old border country legend, became a huge success and brought the author wide fame. He published a number of other poems over the next ten years, including the popular The Lady of the Lake, printed in 1810, and set in the Trossachs. Portions of the German translation of this work were later set to music by Franz Schubert. One of these songs, Ellens dritter Gesang, is popularly labeled as "Schubert's Ave Maria." Scott's last major poem, The Lord Of The Isles, was published in 1815. In 1809, his Tory sympathies led him to become a co-founder of the Quarterly Review, a review journal to which he made several anonymous contributions. In his earlier married days, Scott made a decent living from his earnings at the law, his salary as Sheriff-Depute, his wife's income, some revenue from his writing, and his share of his father's rather meager estate. To increase his income he started a printing and publishing business with his friend James Ballantyne. The enterprise crashed, however, and Scott accepted all debts and tried to pay them off with his writings. Scott's first novel, Waverley, was published anonymously in 1814, a tale of Jacobite rebellion of 1745, which attempted to restore a Scottish family to the British throne. Its English protagonist Edward Waverley, by his Tory upbringing sympathetic to Jacobitism, becomes enmeshed in events, eventually choosing Hanoverian respectability. The novel met with considerable success. There followed a succession of novels over the next five years, each with a Scottish historical setting. Scott included little in the way of punctuation in his drafts, which he left for the printers to supply. Mindful of his reputation as a poet, Scott maintained the habit of publishing the novels anonymously under the name "Author of Waverley" or attributed as Tales of…. Even when it was clear that there would be no harm in coming out into the open, he maintained the façade. During this time, the nickname The Wizard of the North was popularly applied to the mysterious best-selling writer. His identity as the author of the novels was widely rumored, and in 1815, Scott was given the honor of dining with George, Prince Regent, who wanted to meet "the author of Waverley." In 1819, he broke away from writing about Scotland with Ivanhoe, a historical romance set in twelfth century England. Ivanhoe follows the Saxon protagonist, Wilfred of Ivanhoe, who is out of favor with his father owing to his courting of the Lady Rowena (promised to another man) and his allegiance to the Norman king, Richard the Lion-heart, who is returning from the Crusades incognito amidst the plotting of Richard's brother, Prince John of England. The legendary Robin Hood, initially under the name of Locksley, is also a character in the story, as are his "merry men," including Friar Tuck and Alan-a-Dale. Scott's Robin Hood in Ivanhoe helped shape the modern notion of this figure as a cheery, noble outlaw. Other major characters include Ivanhoe's intractable Saxon father, the last descendant of the Saxon King Harold Godwinson; various Knights Templar and churchmen; the loyal serfs Gurth the swineherd and the jester, or fool, Wamba, whose not-so-foolish observations punctuate much of the action; and the Jewish moneylender, Isaac, who is torn between love of money and love of his beautiful and heroic daughter Rebecca, who, in turn, steals the story (and probably Scott's heart) from Ivanhoe and Rowena. The novel was a runaway success and, as he did with his first novel, he authored a series of books along the same lines. The book was published at a time when the struggle for the Emancipation of the Jews in England was gathering momentum. Ivanhoe helped to increase popular interest in the Middle Ages in nineteenth century Europe and America, a fascination that has endured to the present day. 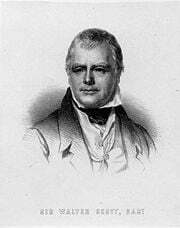 As his fame grew during this phase of his career, he was granted the title of baronet, becoming Sir Walter Scott. When King George IV visited Edinburgh in 1822, the spectacular pageantry Scott organized made tartans and kilts fashionable, turning them into symbols of Scottish national identity. Beginning in 1825, he fell into dire financial straits again, as his company nearly collapsed. That he was the author of his novels became general knowledge at this time as well. Rather than declare bankruptcy, he placed his home, Abbotsford House, and income into a trust belonging to his creditors, and proceeded to write his way out of debt. He kept up his prodigious output of fiction (as well as producing a biography of Napoléon Bonaparte) until 1831. By then his health was failing, and he died at Abbotsford in 1832. Though not in the clear by then, his novels continued to sell, and he made good on his debts from beyond the grave. He was buried in Dryburgh Abbey where nearby, fittingly, a large statue can be found of William Wallace—one of Scotland's most romantic historical figures. When Scott was a boy, he sometimes traveled with his father from Selkirk to Melrose, in the Scottish Border Country, where some of his novels are set. At a certain spot, the old gentleman would stop the carriage and take his son to a stone on the site of the battle of Melrose (1526). Not far away was a little farm called Cartleyhole, and this Scott eventually purchased. In due course, the farmhouse grew into a wonderful home that has been likened to a fairy palace. Through windows enriched with the insignia of heraldry, the sun shone on suits of armor, trophies of the chase, fine furniture, and distinguished artwork. Paneling of oak and cedar and carved ceilings relieved by coats of arms in their correct color added to the beauty of the house. The house contains an impressive collection of historic relics and weapons (including Rob Roy's gun and Montrose's sword), and a library containing over 9,000 rare volumes. More land was purchased, until Scott owned nearly 1,000 acres. A neighboring Roman road with a ford used in olden days by the abbots of Melrose suggested the name of Abbotsford. 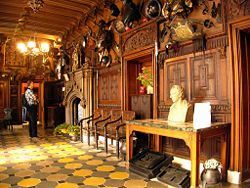 The house was opened to the public in 1833, five months after Sir Walter's death, and has remained a popular attraction. At the height of his fame, Walter Scott was the most popular writer in Europe. Building on the picaresque traditions of Henry Fielding and Daniel Defoe and the Gothic romances of Ann Radcliffe, Scott enlarged the novel's horizons by turning to history as direct source material. Read by nobility as well as commoners and by both men and women, the novel in Scott's hands became a respectable literary genre. Johann Wolfgang von Goethe, Alexandre Dumas, Victor Hugo, Alexander Pushkin, Honore de Balzac, and Leo Tolstoy were all influenced by Scott. Tolstoy's War and Peace, a fictional recreation of Napoleonic Europe and directly attributable by Scott, elevated the historical novel to the summit or artistry. Recognizing Scott's achievement, King George IV made the Scottish writer a baronet in 1820. From being one of the most popular novelists of the nineteenth century, Scott suffered a precipitous decline in reputation after the First World War. Mark Twain had ridiculed Scott's romanticized notion of chivalry in A Connecticut Yankee in King Arthur's Court. Later, in his classic work of literary criticism, "Aspects of the Novel" (1927), E.M. Forster savaged Scott as a clumsy writer who wrote slapdash, badly plotted novels. Scott also suffered from the growing reputation of Jane Austen. Considered merely an entertaining "woman's novelist" in the nineteenth century, Austen came to be seen as perhaps the major English novelist of the first few decades of the nineteenth century. As Austen's star rose, Scott's sank, although, ironically, he had been one of the few male writers of his time to recognize Austen's genius. Scott's many literary flaws (ponderousness, prolixity, lack of humor) were fundamentally out of step with Modernist sensibilities. After going essentially unstudied for many decades, a small revival of interest in Scott's work began in the 1970s and 1980s. Despite Scott's flaws, he is now seen as an important innovator and a key figure in the development of Scottish and world literature. "The Highland Widow," "The Two Drovers," and "The Surgeon's Daughter." "My Aunt Margaret's Mirror," "The Tapestried Chamber," and "Death Of The Laird's Jock." ↑ Stuart Kelly, The Book of Lost Books. Retrieved November 26, 2007. Buchan, John. Sir Walter Scott. House of Stratus, 2009. ISBN 978-0755117192. Hutton, Richard H. Sir Walter Scott. Echo Library, 2006. ISBN 978-1406801361. Sutherland, John. The Life of Walter Scott: A Critical Biography. Blackwell Publishers, 1998. ISBN 978-0631203179. All links retrieved January 15, 2013. Walter Scott Digital Archive at the University of Edinburgh library: includes much primary material. Works by Walter Scott. Project Gutenberg. University of Pennsylvania e-texts of some of Walter Scott's works. The Edinburgh Sir Walter Scott Club. This page was last modified on 30 January 2013, at 20:47.